CB Poultry Saddles, a Hadleigh based business, updated its collection of fleece lined saddles for chickens and poultry breeders, as well as for domestic clients throughout the UK and overseas. CB Poultry Saddles, a family run business based in Hadleigh, Suffolk, launched an updated collection of fleece lined saddles for chickens poultry breeders and domestic clients throughout the UK and overseas. The manufacturer provides a vast selection of saddle models, including basic and butterfly poultry saddles, fleece lined saddles, as well as bespoke sizes and designs. More information can be found at http://www.chickenbreeder.co.uk. Because poultry saddles prevent feather loss on a hen’s back and wings, it is important to fit a saddle as soon as feather loss is noticed. CB Poultry Saddles offers top-quality lightweight chickens and poultry saddles made from rot proof, waterproof cotton canvas. Their breeding saddles that protect birds from aggressive males are also the ideal solution for keeping warm during winter. The fleece lined saddle keeps the hens warm in winter, while allowing them to move freely. The wing protectors are carefully designed to move independently from the saddle so that the hen is not restricted in any way. The poultry saddles are available in 5 sizes from extra small to extra large. All designs include a snap on the end of the wing strap for easy fitting that is held in place by the two white cotton straps. 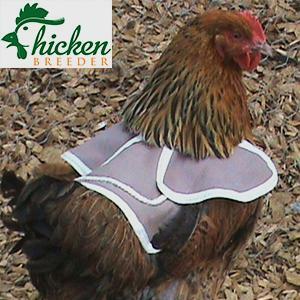 In addition, the easy-to-use snap buttons make putting on and removing the saddle off the hen very easy and fast. Interested parties can find more by visiting the above-mentioned website or https://www.etsy.com/uk/shop/CBSaddlesandcrafts.